We invite you to come for a visit this fall and check out our Things To Do List! There are fourteen colleges and universities in the area. The campuses offer large research libraries, sporting events and museums. A must-see will be the three largest university campuses. While on the NC State campus, be sure to check out the Hunt Library. Its architecture and technology create unique spaces that encourage collaboration and creativity. The bookBot, a robotic book delivery system, can store up to two million items in a climate-controlled environment and deliver any of them within five minutes of a click on the online catalog. The other sites to see should be the Bell Tower (built by the class of 1907 to honor alumni killed in WWI), Pullen Park, the Gregg Art Museum, the Solar House and the JC Ralston Arboretum (6,000 different types of plants from around the world). The brickyard is a popular gathering space for students and a central interchange where every student passes through at one point during the day. At UNC, the oldest public university in the United States, you will want to visit the Old Well. It was built in 1897 and is now a national landmark for the university. Legend has it that, if you drink from the well on the first day of classes, it will bring you good luck (or straight A’s). 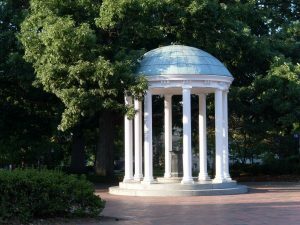 Don’t miss the Arboretum, the Morehead Planetarium, the Carolina Basketball Museum at the Dean Smith Center or Franklin Street’s dining and shopping options. At Duke, the Sarah P. Duke Gardens will be your best place for an outdoor tour. It is located on 55 acres and has five miles of beautiful pathways. 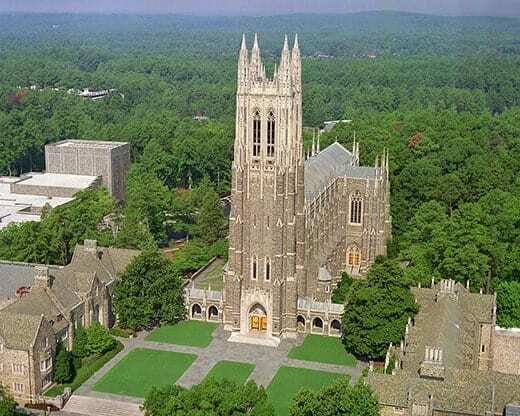 The Duke Chapel, with its neo-Gothic architecture, is a magnificent structure built in 1930. The Chapel tower, standing 210 feet high, is built of volcanic stone from a Hillsborough quarry. The Nasher Museum of Art and the Duke Lemur Center are also must-sees while you are on campus. On the list of museums in the area, you will find science, art and history. You can spend a week just in downtown Raleigh exploring many of them. There is something for everyone on your list to enjoy in this collection of museums. The symphony, ballet and opera perform on stages inside the Duke Energy Center for Performing Arts in downtown Raleigh. The Meymandi Concert Hall hosts national and international artists who boast of the hall’s remarkable acoustics. And the Durham Performing Arts Center (DPAC) in Durham hosts over 200 events a year. It is currently ranked as the #4 theater in the United States. The list of events for these performance venues is endless and Springmoor provides residents transportation for many of these performances throughout the year. 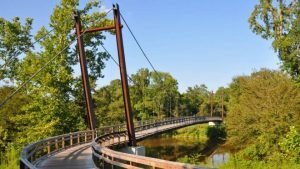 Raleigh is home to 180 miles of greenways, which are perfect for walkers, runners, cyclists and skaters. The greenway system connects many of the universities and museums. Suspension bridges, nature trails, lakes and picnic areas are all included along the paved pathways. 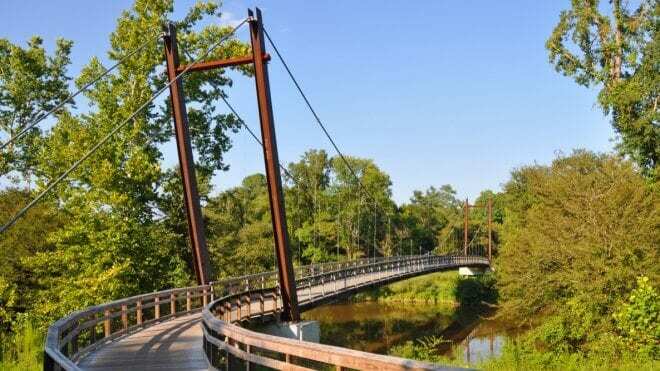 The Eno State Park connects Durham and Chapel Hill and offers over 30 miles of trails. Camping, canoeing and kayaking are favorites with hikers along these trails. The Umstead State Park trails surround three man-made lakes where fishing and canoeing are popular. Raleigh has hosted the Wide Open Blue Grass Festival for the past six years. 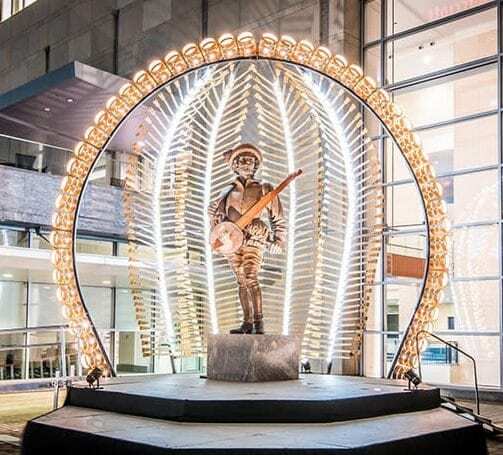 Since moving from its home in Nashville, Tennessee, the attendance has continued to grow each year and had a crowd of more than 220,000 this year. Of course, the NC State Fair is always a favorite with rides, food (and more food) plus nightly fireworks and musical entertainment. There are arts festivals, light shows and other holiday favorites throughout the year scattered in every corner of the Triangle. Mark these fun events on your calendar during your visit. 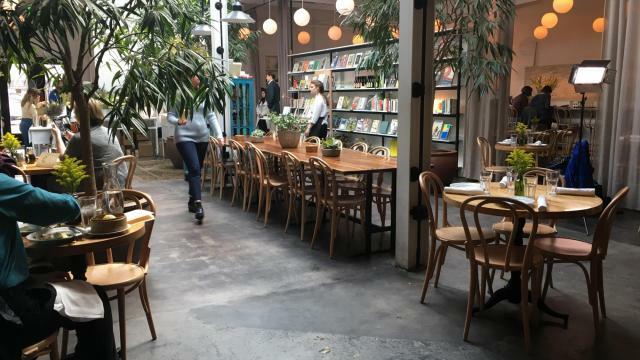 If food is your favorite, you should make a reservation at one of Ashley Christensen’s restaurants. In 2014, she was awarded the James Beard Award for Best Chef: Southeast. She has six venues featuring her classic Southern ingredients. For hip, modern Laotian fare or small craft breweries, try sister restaurants Bida Manda and Brewery Bhavana on Blount street. These two award-winning restaurants are the most sought after reservations in Raleigh. Glenwood South is home to many new food experiences also, as is Durham’s Main Street. Besides the best NCAA basketball in the United States, the Triangle is home to NHL hockey, women’s and men’s national soccer teams and two professional minor league baseball teams. The basketball rivalry on Tobacco Road between Duke, UNC and NC State has everyone wearing their team colors from the first midnight tip-off game in October through March Madness. The three schools are within a half-hour drive of each other. Ready to plan your visit? 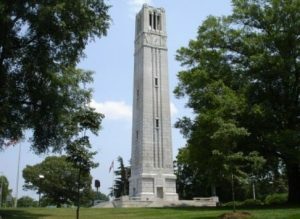 Raleigh, Durham and Chapel Hill offer a wide variety of activities for you, your family and your friends. When you schedule your Springmoor visit, we will be happy to tell you more about our favorite spots. It’s a great place to visit and an even better place to live. Mark your calendars now for a taste of Southern charm. 919-234-7626.